This article was originally published Dec 22, 2014. The blog was not published over the Christmas/New Year period, and even though the article is a few weeks old, I feel it is worth republishing. South Sudan’s Jonglei state is emblematic of the regional, national and local challenges to peace and of the limitations of trying to resolve a conflict by engaging only two of the nearly two-dozen armed groups in the country. Despite eleven months of peace talks mediated by the Intergovernmental Authority on Development (IGAD), South Sudan’s civil war threatens to intensify in the coming weeks. Most of the nearly two dozen armed groups in South Sudan are, at least nominally, allied with President Salva Kiir’s Sudan Peoples’ Liberation Army (SPLA) or former Vice President Riek Machar’s SPLA-in-Opposition (SPLA-IO). Yet most of these groups are not battling for control of the central government and their casus belli is different from that of Kiir or Machar. Some groups are fighting over land and representation in state and local governments, while others are caught in cycles of revenge attacks that began with atrocities against members of their community. 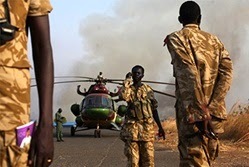 Crisis Group’s latest report, South Sudan: Jonglei – “We Have Always Been at War”, calls for IGAD to enhance its political presence in South Sudan, to better engage with armed groups and to ensure talks in Addis Ababa reflect the diversity of armed interests on the ground. Jonglei state’s mix of violent ethnic militias, armed political opposition, intercommunal clashes and dysfunctional governance were part of the tinder that led to the outbreak of South Sudan’s civil war a year ago. Today, civilians are displaced and starving, and a return to war is all but guaranteed. While the government has the upper hand militarily, interminable rebellion and continuing regional interference point to a turbulent future. The trajectory of the war in Jonglei demonstrates the dangers of limiting IGAD’s peace process to only the government and Riek Machar’s SPLM/A-IO (Sudanese Peoples’ Liberation Movement/Army-In Opposition). IGAD should expand its political presence in South Sudan to engage more directly with the various armed groups – including non-South Sudanese ones – and the communities that support them. Engaging these groups is critical to building support for a future peace agreement and to ensuring that Salva Kiir and Riek Machar cannot use these armed groups to undermine talks or an agreement. The multiplicity of armed groups and their independent nature suggest that far more effort should be dedicated to discussions about security arrangements that go beyond the government and the SPLA-IO. Much of the political work should be done in South Sudan, not Addis Ababa, and IGAD should carefully assess which conflicts require resolution at the national level and which should be addressed at the local level. Engagement with armed groups will lay the groundwork for the national political processes and transitional arrangements that are needed for a sustainable peace once a deal is reached in Addis Ababa. “This war cannot be resolved by engaging only two of the nearly two-dozen armed groups in the country and ignoring those that have not yet entered into the fight”, says Casie Copeland, South Sudan Analyst. “IGAD should enhance its approach, which already includes regional and national tracks, with strengthened engagement with armed groups to move the peace process forward”. “As the case of Jonglei illustrates, armed groups continuously assess their alliances, make and break them frequently, and will do the same with respect to the benefit or detriment they perceive from a peace agreement”, says Cedric Barnes, Horn of Africa Project Director. “Kiir and Machar have built their coalitions on these shifting sands and any deal between the two could fall apart if their constituent groups don’t see an advantage for themselves. This calls for more systematic engagement at the community level”.